It’s Saturday. It’s hot. We’ve moved apartments. 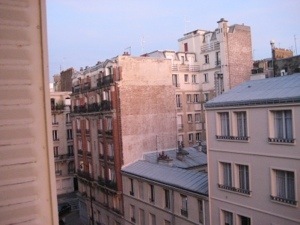 We have loved our Studio Apartment and these are some views from the window. We were intrigued with the car parking down below. Ah we are sad to pack up and leave here – it has been a wonderful home away from home. 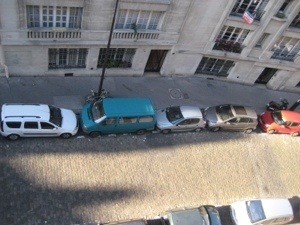 Our kind host Andre offered to drive us into Saint Germain to our new apartment. Our new narrow street is filled with restaurants and we are on the fourth floor. 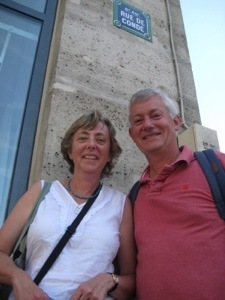 We are very close to St Sulpice and listen to the bells ring on the hour – they are loud and melodic, but perhaps I won’t think so at midnight. The apartment is pocket sized and compact but comfortable and cool – with a washing machine! 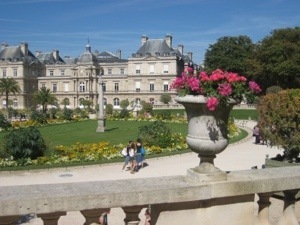 Think location – shops, museums, galleries, the Seine and the Luxembourg Gardens. They are all a few minutes walk away. 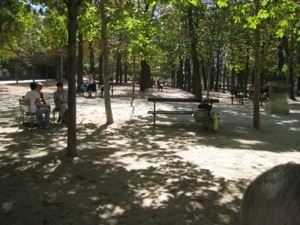 Today is a day for sitting in a shady spot, so we made our way to eat our baguettes in the Luxembourg Gardens. It is a day to be slow. Going to the gardens is a bit like Sydney-siders going to the beach – the sun shines and you head to the beach. The gardens were filled with people, families, children, tourists, locals all looking for chairs and a place to sit.Even with crowds, there is a sense of peace and calm and the only sounds you hear are people’s voices chatting and laughing – in French, English and many other languages – it is just a soft background lull. These gardens are large and beautiful. 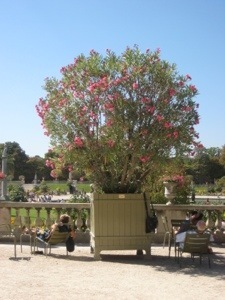 I have never seen oleanders in giant pots, neatly clipped into shape – they look spectacular – as do the pots of pink geraniums and petunias. 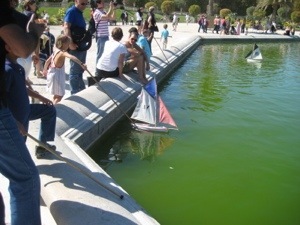 In the middle of the park is a tiny lake where children sail their boats. The sails are brightly coloured and you need to watch out for the children carrying their long sticks to push their boats around – they run around with gay abandon. I feel like I am watching a scene of Seurat. While we sit in the park, our niece Laura is celebrating her 21st birthday with a Mad Men party. 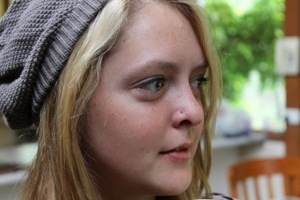 All our family will be there, so there is a twinge of sadness that we are not there too. C’est la vie! Happy birthday Laura! We come home via Rue de Conde. How cool is that! 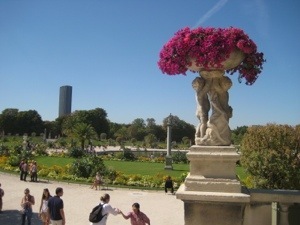 This entry was posted in Travelling and tagged Luxembourg Gardens, Paris, Saint Germaine. Bookmark the permalink. Sarah I did French in High school and for HSC so Paris is a city I KNOW…well in theory tho I have been there twice..in 1974!!! and 1979!!! Hmmm how old am I? Are we? Thrilled for you. Me too. Just wish I had kept the language. The city is way better in the flesh than in theory. Tracey, it is time you came back! A little diiferent to where you are now!